Today (August 2), I finished my second day of work at my new job. It was a rainy day and as I walked home I realized I really missed being at UCA. On July 1, I was at Manas International Airport (FRU)1 to take a flight to Almaty, Kazakhstan. I was traveling with Miriam, whom I had met at Yale when she was a junior who had just come back from a year in Japan. At the time, I was a freshman who, in her words, “never talked,” though I did eventually become much closer with her. I’d like to think I changed quite a bit as a person (mostly for the better?) during college, just as I think that I had been shaped in the last year abroad. We had heard earlier in the day from multiple independent sources that it would have been much cheaper and somewhat faster to drive from Bishkek to Almaty but we were stuck with the tickets that we had booked earlier. It was finally time to leave and I felt a bit numb. Goodbyes are profoundly unsatisfying, more so when leaving people and relationships that matter. I’ve always found places to be easier to leave behind because I often think of place as a backdrop, reduced (perhaps unfairly) to containers for humans. 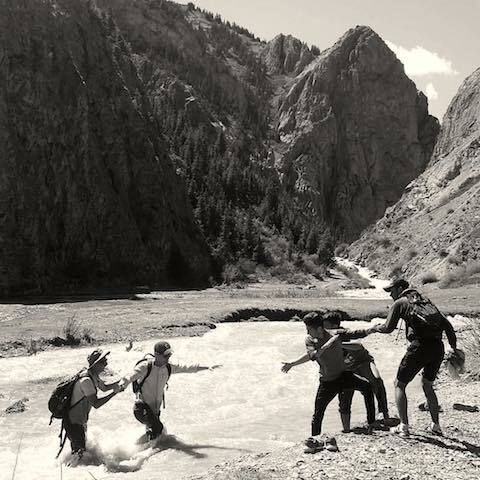 But that moment, as I realized that I didn’t know when I would be back to Kyrgyzstan next, if ever, was painful. I mostly held myself together as I walked past security into the single international terminal of Manas. But by the time I sat down in one of the side seats in the crowded waiting area, my vision was mostly obstructed by tears. I went to the bathroom and cried in the stall because even when you look off to the side while sitting from a side seat in an airport and pretend like you’re not crying, people can still see and it’s awkward for everyone. After I wasted a ton of toilet paper and my eyes were puffy and sore, I went back out and cried some more. Miriam is probably the best type of person in this situation; she gave me lots of time and room, wasn’t judgmental, and bought me ice cream to cheer me up after I had thoroughly dehydrated myself. We boarded not long after from the right side gate2. Air Astana is unlike most airlines that I’ve flown with- it had dedicated theme music which played during boarding and while the plane was speeding down the runway during take off. While Miriam and I walked to our seats, an acoustic guitar version of Yesterday played. But as the plane lifted off into the air, the lively Pirates of the Caribbean theme lightened the mood and was actually a nice reminder that I was about to go on a really cool trip with a really good friend. The inflight screen showed that the flight was only about 45 minutes long, so I decided to talk with said friend rather than take a nap that would have ended far too soon anyways. I spotted a yellowish trail of smog in the sky below while the plane descended into Almaty. 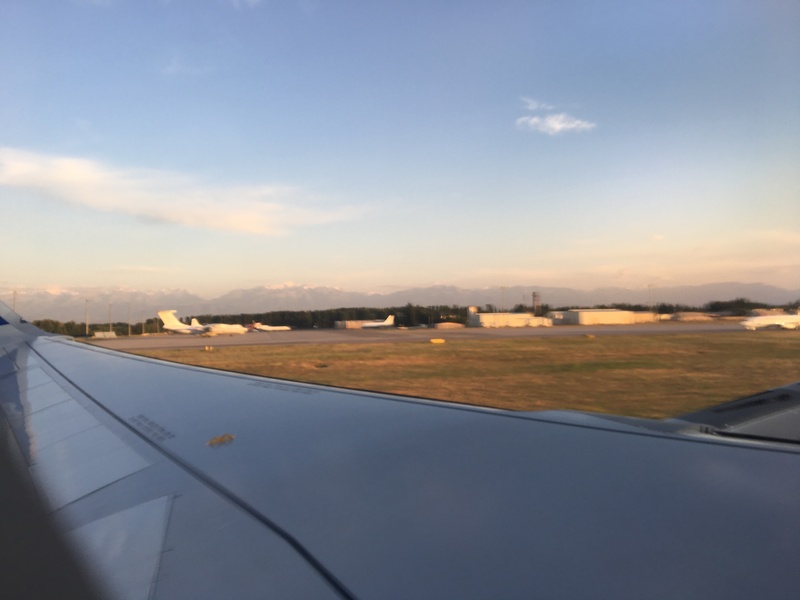 As the plane pulled in slowly towards the jetbridge, Miriam and I discussed the usual traveler’s logistics: how we would get to the hostel, how much money we needed, when we would wake up the next morning. Yesterday played again when we left the plane. While the bittersweet tone was fitting in the moment, I wouldn’t fully understand the feeling of longing quite yet.